One of the best views of a tall ship is from a tall ship! There are multiple outings throughout the weekend, during the day at at twilight. 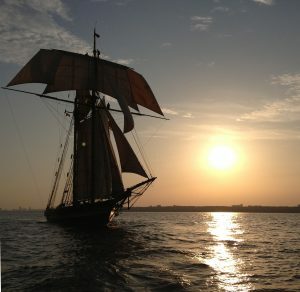 Don’t miss the Parade of Sail from land or the water on Thursday, August 1 with all seven tall ships. For Parade of Sail map, click here. Please Note: Times are wind and weather dependent. Rain or shine event. Ship participation is Captain’s option. Some rules apply for cancelled tickets. DAY AND TWILIGHT SAILS: Featured vessels providing 80 minute day sails and 2-hour twilight sails are Kenosha’s own Red Witch and Appledore IV, from Bay City, Michigan throughout the weekend.